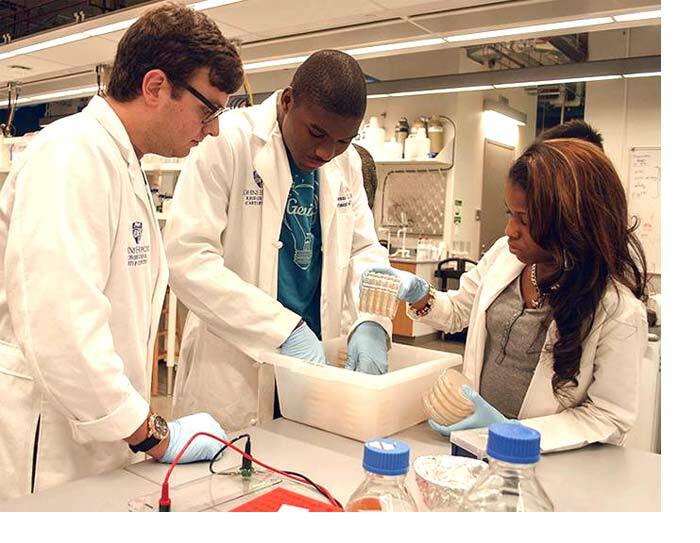 The Biophysics Research for Baltimore Teens (BRBT) program provides opportunities for Baltimore City high school students to experience hands-on biomedical research in a state-of-the-art research facility at Johns Hopkins University. BRBT paid internships are five days a week for a six-week period, from June 26th through August 4th. BRBT interns experience the excitement of scientific discovery in a high-tech teaching laboratory equipped with the latest in research instrumentation under the guidance of two full-time instructors. BRBT’s goal is to give the students confidence, mentorship, and know-how to excel in the research laboratory, and to give them a pathway to a career in biomedical research. BRBT brings together a mix of students and mentors, ranging from high school sophomores to Johns Hopkins undergraduates. In addition, students spend part of their time in Hopkins research labs with graduate students, post-doctoral researchers, and faculty. This exposure to a cross-section of scientists helps high school students see a clear path from their current studies to a lifelong career in science. In addition to learning valuable lab skills, BRBT interns attend class where they learn the scientific concepts at the core of the experiments they perform in the lab. This aspect of the internship program helps students develop critical thinking skills necessary for them to be successful throughout high school and beyond into college. BRBT students focus on biophysics research, first learning how to prepare reagents and materials for biophysical studies, and then quickly transition into microbiology techniques and DNA and protein engineering. This curriculum gives them not only the basic building blocks for biomedical research, but also the thrill of molecular-level discovery.